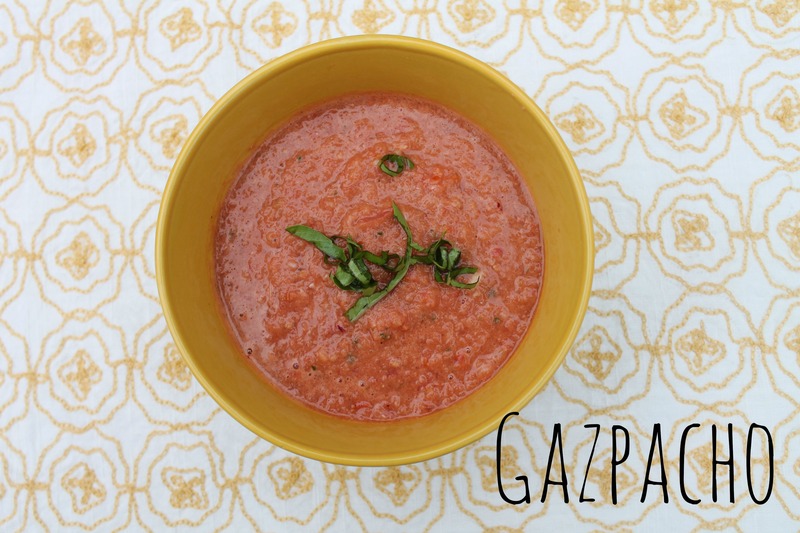 I almost called this recipe “the busy person’s gazpacho.” However, really, I’m not that busy. But lazy. That I am. Very lazy. I simplified the procedure, but the taste remained. Then last summer when I joined the CSA for the first time, I always seemed to have extra random vegetables to use up, so I started experimenting with substitutions, and I discovered that the recipe was very adaptable. Have an extra zucchini? Throw it in. Did you not get any red bell peppers this week? Forget them. The typical way to make gazpacho is to dice everything very small, puree only half of it, then mix it all together, so the end result is kind of chunky. However, part of my lazy adaptation is just chopping everything rather large, then pureeing the whole thing at the end. I really like it this way, but if you prefer yours with bigger chunks, then follow Alton’s method. I won’t judge. Well, much. Adapted for the lazy person from Alton Brown’s gazpacho. 1. Mix all of the ingredients, except the basil, in a bowl. 2. Puree in three batches in the blender. Be careful when you are pouring the batches into another bowl, because it splashes. 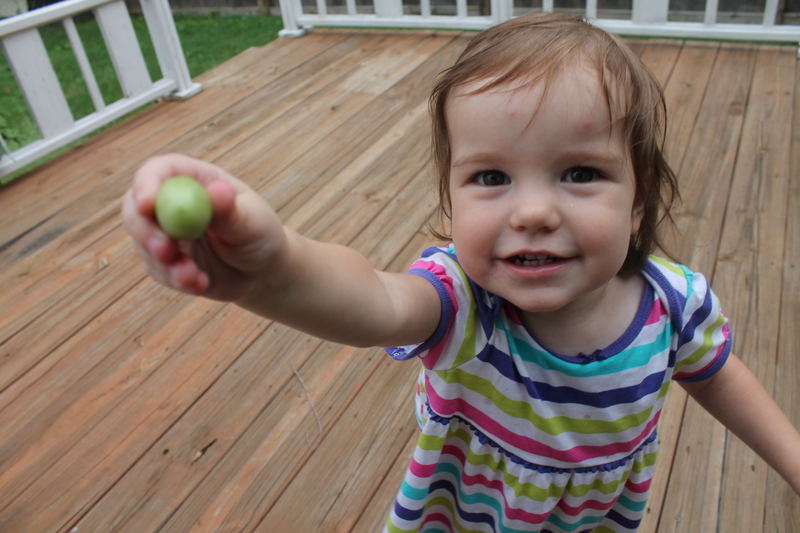 And tomato stains can be difficult to get out of clothes. 3. Chill for at least two hours, but the longer the better. I think it tastes better the next day! *This is an excellent way to use up less-than-ideal tomatoes! As life would have it, the past few weeks we’ve had people over for various reasons. Some are pregnant; others are not. Some are really into a good alcoholic drink; others are more ambivalent towards spirited beverages. So, I wanted to come up with a versatile summer drink that could be alcoholic or non-alcoholic easily. I posed the question on Facebook, and after some confusion [Alison] that it was a veiled pregnancy announcement [it wasn’t], I got some great suggestions! However, despite all of that, I just decided to make up my own recipe. 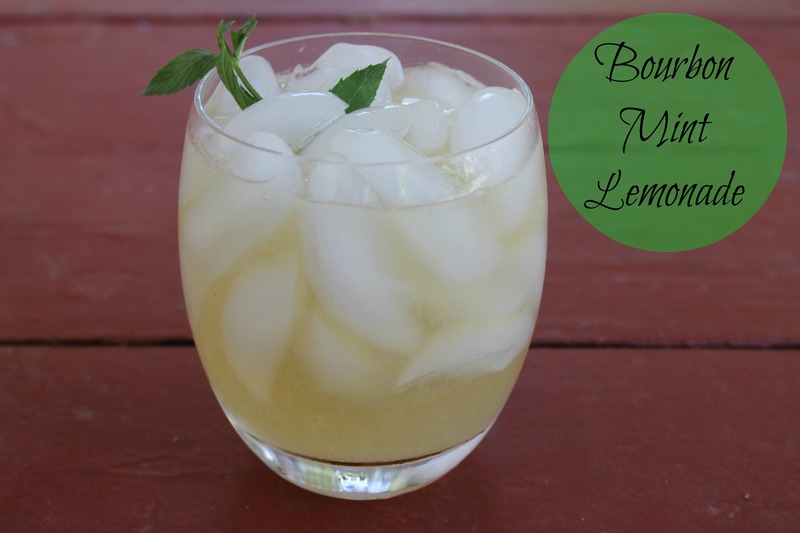 The lemonade is really quite fabulous on its own, but the bourbon gives it that extra yummmmm factor. It is so great for a crowd of people, but it’s simple enough to do on a weeknight. And I think it tastes better if you drink it on a front porch swing, but that’s just me. Important note: this recipe makes a lot. Like, we had 13 people over, and there was still some left over. The recipe can be easily halved or even quartered to suit your needs. 1. Heat the sugar and 2 cups water in a medium saucepan on medium-low heat until all of the sugar has dissolved. Stir often. You now have simple syrup. 2. Take the pan off the heat and add the mint leaves. Allow the mint leaves to seep in the simple syrup for half an hour. Remove the mint. 3. Mix together the simple syrup, lemon juice, and remaining 14 cups of water. Chill in refrigerator. 4. To serve: fill a glass with ice and pour in the lemonade. Add a splash of club soda [this step seems unimportant, but it really heightens the drink.]. Optional, add bourbon to taste. [I like about 1 ounce of bourbon, whereas Ryan preferred something more in the 1 1/2 to 2 ounce range. And some of our friends just wanted a splash.] Garnish with a mint leaf, if you are so inclined. I am not quite back into the rhythm of blogging since my hiatus, but I thought I’d share one of my go-to, ridiculously easy recipes. Yes, I know it’s July. And sweltering weather doesn’t necessarily scream “soup,” but whatever. Now, this is not a “main dish” soup. It’s more of an accompaniment to other fare. I usually serve it alongside lettuce wraps or (like today) potstickers. What I love about this soup is that it has wonderful, complex flavors: it seems fancy, but it’s made of ingredients I almost always have around the house. It starts off sweet, then finishes with a kick of spice. It’s also a great way to use up carrots that haven’t necessarily gone bad, but perhaps are a little limp and past their prime. And even though it does contain dairy, it actually freezes and re-heats quite well. 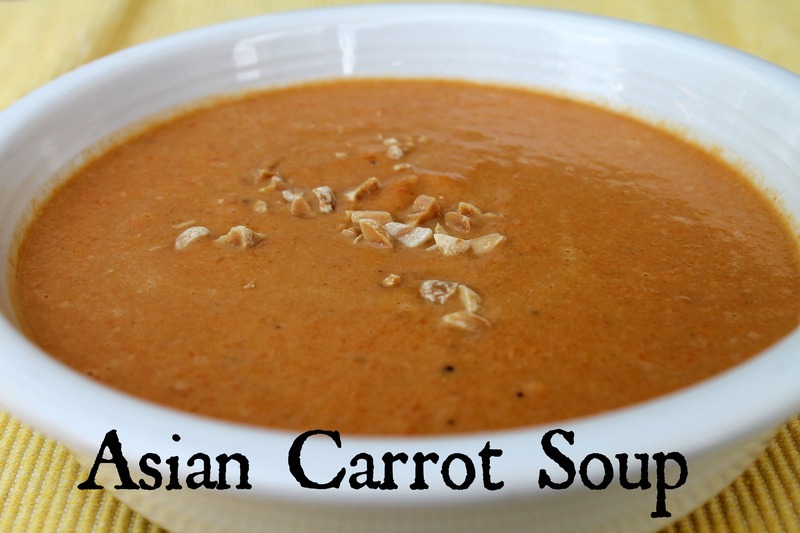 I’ve made quite a few adaptations, but the original recipe is based on the third place winner from Amateur Gourmet’s soup contest a few years ago. 1. In a large saucepan over medium heat, stirring often, cook the onion and garlic until the onion is softened. 2. Add the carrots, ginger, chile flakes, and broth. Cover. Bring to a simmer. Reduce heat to low and simmer until carrots are very tender, about 45 minutes. 3. Turn off the heat. Stir in the remaining ingredients. 4. 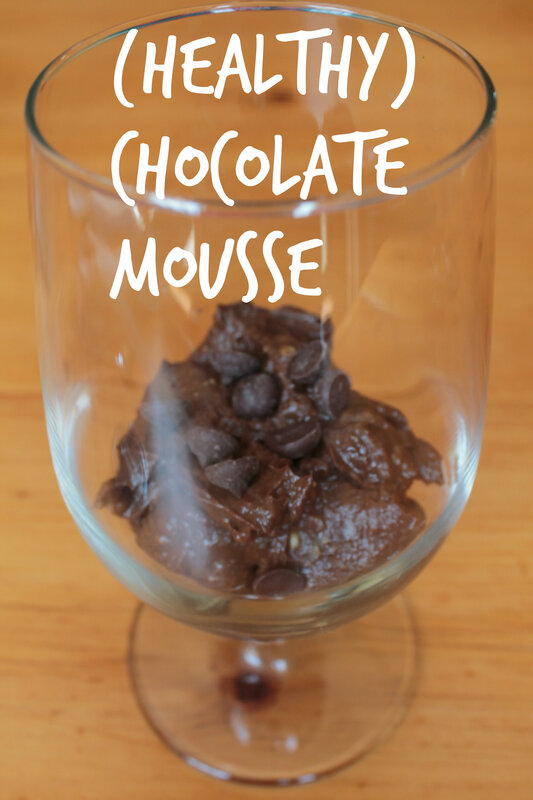 If you have an immersion blender [one of those “gadgets” that actually gets a lot of use! 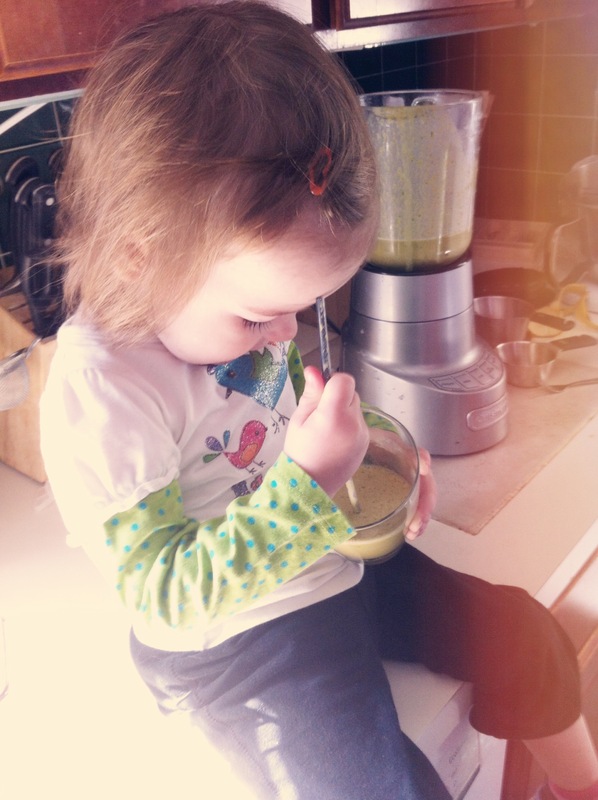 ], blend until all the ingredients are uniform. If not, blend it in batches in the actual blender. Be careful, because it’s hot. 5. Return pureed soup to the stove. Heat over low until hot. Be careful not to boil. 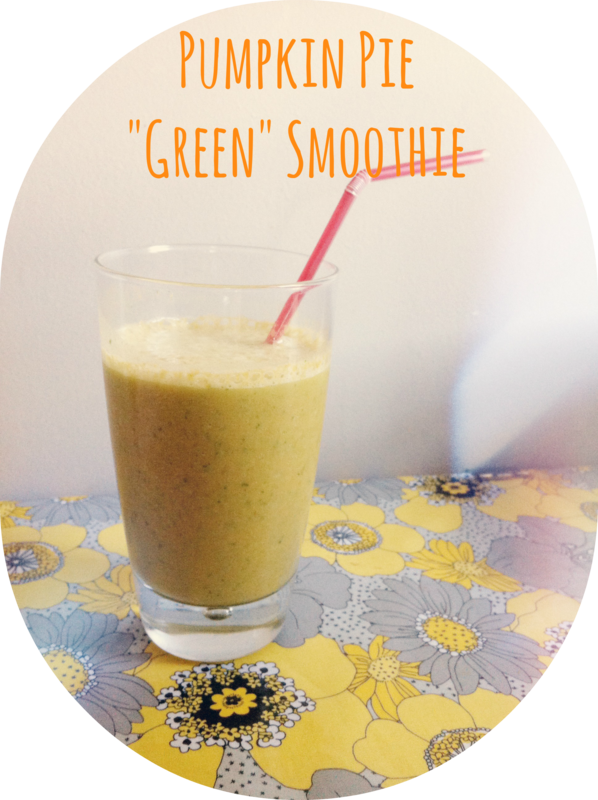 *You could probably substitute 1/8-1/4 teaspoon of dried ginger for the fresh, but it will slightly affect the flavor. I keep “fresh” ginger cut into pieces in the freezer. It’s easy to pop one out to use for recipes such as these. **Sesame oil is available on the international aisle of the grocery store. It’s a great condiment to have around. You only use a teaspoon or so with most recipes, so it lasts awhile, but really adds some good flavor. ***I’ve never tried it, but I bet substituting coconut milk for the regular milk would be delightful, if you are avoiding dairy. In that case, I’d say to cut out the honey. 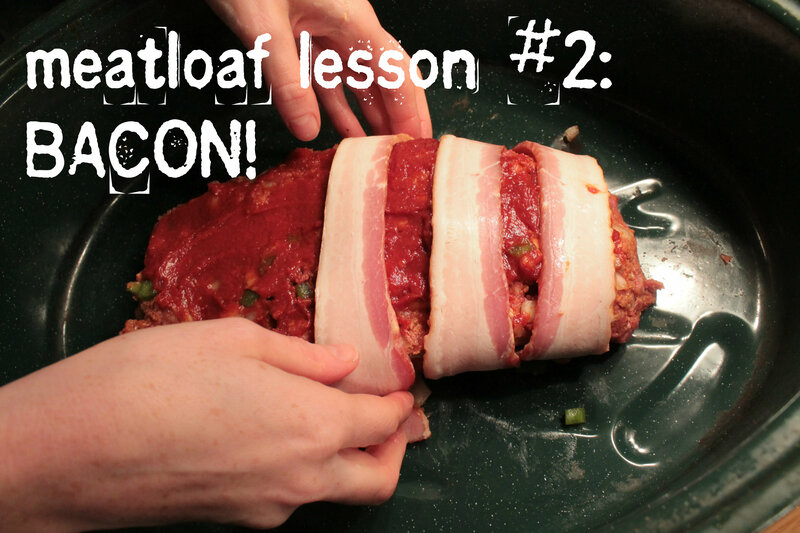 Let me be clear from the start, this is not exactly my first-Atlanta-roommate Michelle’s meatloaf, because I’ve tweaked it quite a bit over the years, but it certainly emerges from her inspiration. It’s become a cliche, but bacon does, indeed, make everything better. Michelle would put the bacon on the bottom of the loaf, but I like it a little crispier, so I put it on top. Aaaand, I know this is obnoxious, but I also like to make my own ketchup. It is easy and fantastic. Not at all necessary for this recipe, but highly encouraged. 2. Mix everything together, except the bacon and 2 T of ketchup. 3. 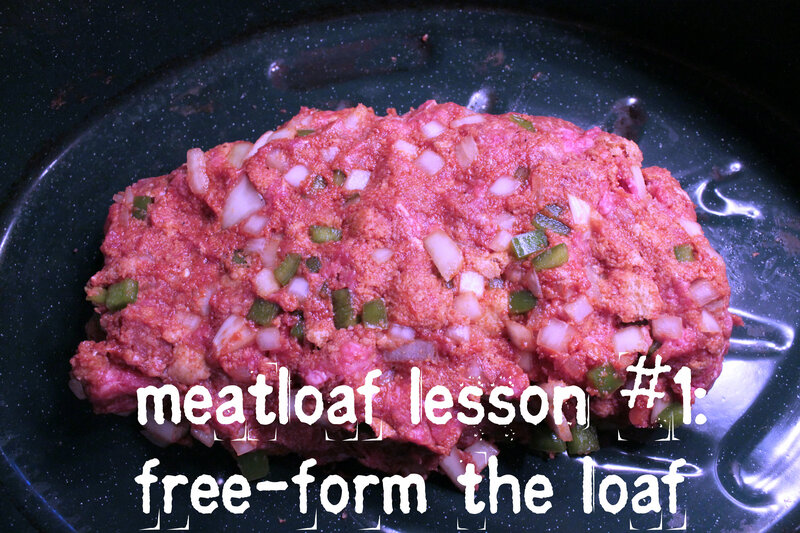 Mold into a loaf in a roasting pan. 4. 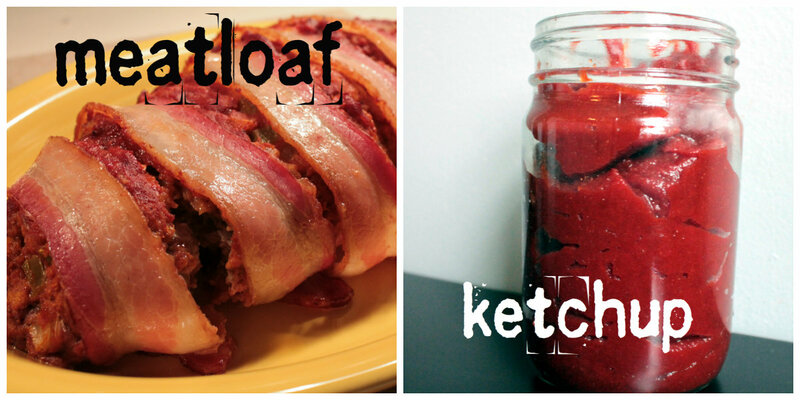 Spread the 2 T of ketchup on top, and wrap with bacon. 5. Bake covered for 40 minutes, then uncover and bake for another 15-20 minutes, or until internal temperature reaches 160 degrees F.
Adapted from this recipe at Heavenly Homemakers. 2. Store in an airtight container (like a jar) in a refrigerator. It should last up to 2 weeks, but you can always freeze extra. Note: this makes very thick ketchup, so if you want it a little thinner (especially if you use it in a squeeze bottle), just add water a Tablespoon at a time until desired consistency. *IMPORTANT UPDATE: After making this recipe soooo many times, there are a few things I have changed. The bread torn apart is great, but I have also just pulverized some almonds in my food processor (about 1/2 cup after processing) and added that. It makes the texture slightly different, but it is still excellent. Regarding the ketchup- I think I have decided that this recipe has too many spices. Lately, I’ve been eliminating the cloves and just doing an 1/8 teaspoon of cinnamon. It is still very flavorful.